Bible as laser metaphor picture. Words, especially negative words spoken over us when we are children, can have long-term & devastating impact on us in life. We went to church on 07/December/2014 & the pastor’s wife gave a short talk describing a scene which really struck me… so much so that I sketched it on my notepad immediately! She said that we often have a word spoken over us which is very unhelpful, often directed at us when we are children (and adults sometimes!) For example, a parent might say to a child “You’re useless” or “You’re a pain” & if that child hears the word spoken over them (ie about them) many times, then they may subconsciously begin to believe that it is true about them, & then they may align their behaviour with that word. The word spoken in hast, or unthinkingly can have a devastating & long-term negative impact on the person in question; it tends to “pulls us down” & mould our character until we reflect that unkind word. This naming & shaming by a dominant parent-like figure may happen to some degree to a lot of us (especially when we are vulnerable children) but you might think that such words would have no impact. However, if we hear that word often enough, particularly from someone we trust (like a parent, guardian, teacher, friend, etc), then we may start to believe it, & that is the beginning of the problem. We can “carry” that word-label with us for all of our adult life, resulting in a negative self-image which affects our confidence & erodes our self-worth. The Bible laser beam: our choice. The pastor’s wife went on to say that a beam of laser light can be so powerful that it can cut through steel. She likened the Bible to a laser beam; “focussed truth” that cuts through any lie about us. God reveals what he thinks about us through the Bible & He can cut through the negative words said over us, which we may have believed for years, & we can start to believe what God says (via the Bible) about us instead. We can either continue to believe the unhelpful, destructive word spoken over us/about us, or else we can believe what God has said about us, which is to be found in the Bible – the choice of which to believe is up to us. In that way, we have a part to play in our own recovery. We need to be determined to think kind thoughts about ourselves, especially if we struggle with low self esteem, as so many of us do these days. There are many Bible quotes that leave is in no doubt that God loves us deeply, but it is up to us to make that choice: either believe what some unthinking, unkind person has said, or else believe what our heavenly Father says about us. The choice is ours to make. 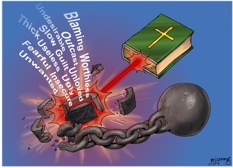 My illustration shows a metal ball & chain, which the pastor’s wife mentioned in her word picture. She said the negative word spoken over us is just like that ball & chain, in that it keeps us shackled to the mistaken belief that we must be like that unkind word. 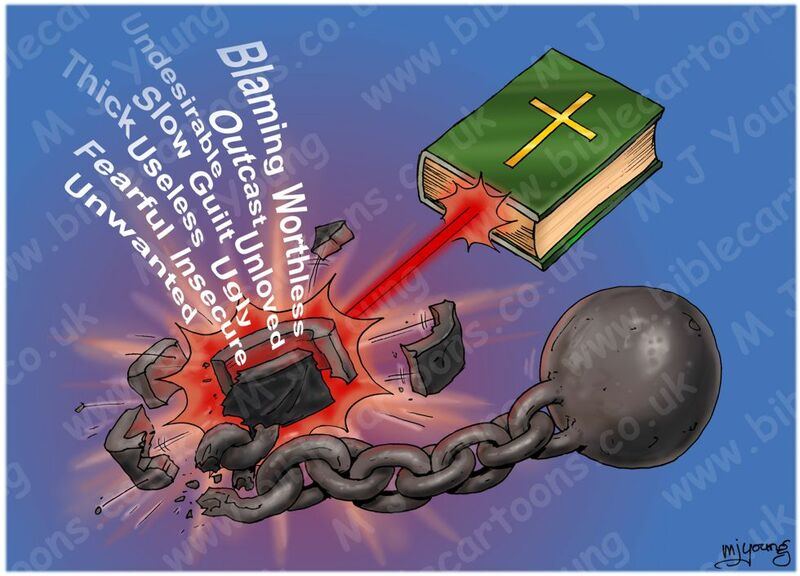 The Bible tells us the truth, & cuts us free from the ball & chain, as I have shown in my illustration. Sermon/teaching theme suggestions: This picture could be used to talk about truth, especially that which is revealed in the Holy Bible. What God thinks about us, & how that knowledge directly challenges & overcomes the lies of Satan about us. The picture could be used to highlight the struggle or battle for our minds, which we wage every day, between what Satan says about us & what God says about us. Trust in God’s goodness & the powerful weapon of the Word of God (the Holy Bible) is made apparent in this metaphor picture.